Nominations for the American Go Foundation’s Teacher of the Year award are now open. The award is presented each year at the U.S. Go Congress and recognizes an outstanding American teacher. The winner will receive an all expenses paid trip to the congress. To be eligible, a teacher must be a member of the AGA, have been teaching go to children for at least two hours a week (during the school year) for two years, have started a go club or organization for youth, and have helped their students enter appropriate tournaments, if possible. If you would like to nominate someone for this award, including yourself, e-mail mail@agfgo.org. Nominations are due by May 15th and should include a description of the teacher’s activities, how long they have been teaching, and how many students attend their program. - Paul Barchilon, E-J Youth Editor. 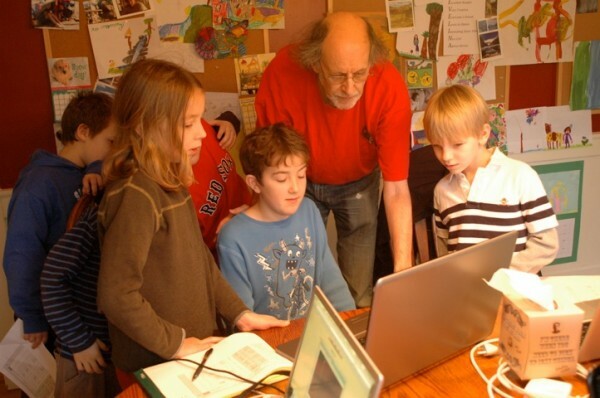 Photo: Last year’s winner Peter Freedman, working with kids in Portland. To read more about Peter’s work, click here. The Pandanet AGA City League has been going strong for four rounds now. With a couple more games and one more round to go, at least one league is cutting the top positions close. In the A League, Greater Washington and Boston are in the lead with 6 points each. As they faced off this past round GW got the better of Boston but they’re holding on from previous wins. Hot on their tails is LA and Seattle 1. LA still has one game left to play and they will most likely be in playoff contention. The B and C Leagues have pull-away leaders in Princeton and Berkeley. Both teams are new this year with strong players behind them. They lead their leagues with 8 points each. The next team is currently at 4 points each. Round 5 will take place on April 26th at 3PM unless otherwise noted on the schedule pages. 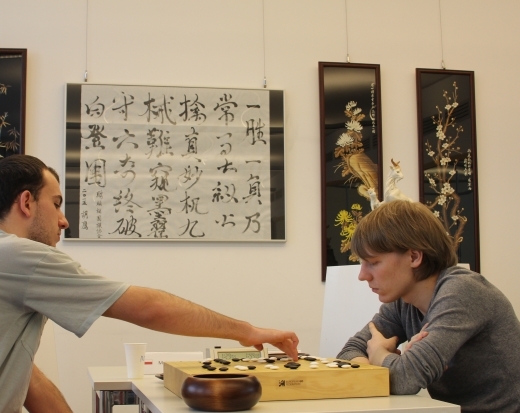 Ilia Shikshin 1p (right) of Russia is the 2015 Grand Slam Champion, after defeating Mateusz Surma 1p (left) of Poland in the Grand Slam Berlin tournament, held earlier this week at the Chinese Cultural Center in Berlin, Germany. Ali Jabarin was third, Cristian Pop took fourth and Pavol Lisy was fifth. More reports and photos here and click here for complete results. 44th Amsterdam International Go Tournament Coming Up in May: Preparations for this year’s edition of the Amsterdam Go Tournament – coming up May 15-17 — are in full swing. For almost half a century this has been one of the main go tournaments in Europe, and with Roel van Kollem as the fresh and enthusiastic new chairman of the Amsterdam go club there’s promise of a new atmosphere to the tournament. A special addition to the tournament this year will be Guo Juan 5P, who has been living in Amsterdam for many years and who will be giving lessons and seminars onsite. As an extra bonus, each participant will receive one gift voucher for three lessons on Guo’s website. An added attraction for food lovers is that van Kollem, who’s also a chef (right), will be preparing some exciting food for the Rapid tournament which is held besides the main tournament on Friday. New Go-shirts by Murugandi from BadukMovies: Kim Ouweleen, better known as ‘Murugandi’, is a Dutch 4-dan. He is mostly known for his go tutorials for EuroGoTV and BadukMovies, but in everyday life Murugandi is also an illustrator and graphic designer. 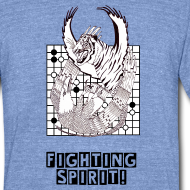 Recently he has designed some go themed t-shirts, which can be found through the BadukMovies webshop and through Kim’s own webshop. You can also check out more of his artwork at murugandi.com. Kiseido’s Latest Available at Het Paard’s Go Shop: New go books published by Kiseido are now available in the Het Paard’s Go Shop, including the second volume of “The 2014 Ten-Game Match between Gu Li and Lee Sedol,” which features in-depth analysis of games 6-8 of the historic ‘Death Match’: the Jubango between two of the strongest go players of the modern era, Lee Sedol 9p from Korea and Gu Li 9p from China. Also avalailable is “The Basic Principles in the Opening and the Middle Game,” 20 principles that will lay the foundations for the study of opening theory in general as well as the currently popular opening systems, and “The Basics of Life and Death,” an introduction to life and death by Rob van Zeijst. This year, the first two rounds were played on January 26. Listing the results will serve as a review of 2014 tournament go. In the first round, Ichiriki Ryo, King of the News Stars and winner of the Globis Cup and O-kage (Gratitude) Cup, beat Yo Seiki, winner of the Yucho (the post office bank) Cup; Motoki Katsuya, winner of the Hiroshima Aluminium Cup, beat Fujisawa Rina, Women’s Honinbo and winner of the Aizu Central Hospital Cup; Takao Shinji, Tengen & Judan, beat Ida Atsushi, selected by fan vote; Yuki Satoshi, NHK Cup-winner and Kansai Ki-in Number One, beat Xie Yimin, Women’s Meijin and Kisei; Kono Rin Ryusei beat Hane Naoki Okan; Murakawa Daisuke Oza beat Cho Chikun, winner of Masters Cup; Iyama Yuta, Kisei, Meijin, Honinbo, Gosei, winner of Agon Kiriyama Cup and the first term of this tournament, was seeded into the semifinals. In the second round, Motoki beat Ichiriki, Takao beat Yuki, and Kono beat Murakawa. The semifinals and final were held at the Nihon Ki-in in Ichigaya on March 29. The semifinals were played in the morning; Iyama (W) beat Kono by resig. and Takao (W) beat Motoki by resig. Actually Iyama started badly in the middle-game fighting against Kono, leading Kobayashi to predict an imminent resignation, but Iyama managed to pull off an upset. The afternoon final fittingly matched the two most successful players in top-seven titles last year: quadruple title-holder Iyama vs. dual title-holder Takao. Iyama drew black in the nigiri and killed a large white group, forcing Takao to resign after 157 moves. The commentary on the same stage was given by Kobayashi Satoru 9P and Yoshihara Yukari 6P (earlier they covered the morning games as well). There’s an art to giving commentaries in the presence of the players (who can’t see the demonstration board, of course). Usually the commentators avoid mentioning black or white and instead hold up a black or white stone to show the audience which side they are talking about. However, Iyama joked later that he owed his win to occasionally catching Kobayashi’s comments. 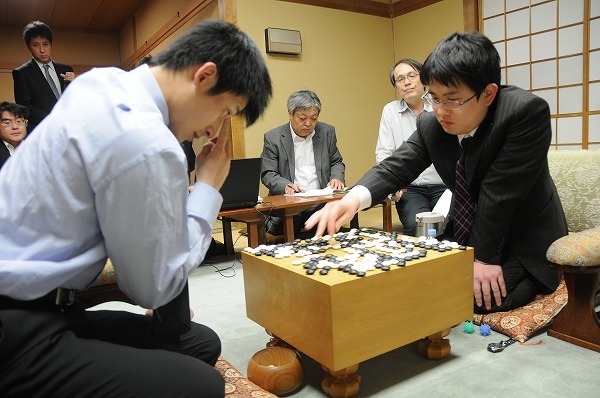 Yamashita becomes Honinbo challenger: Three players were in the running as the 70th Honinbo League entered its final round, held on April 2: Yamashita Keigo (at right), Cho U and Ida Atsushi. However, only Yamashita could win the league outright. Last year he slipped up at the end, losing to Ida Atsushi and letting him force a play-off, which Ida won. 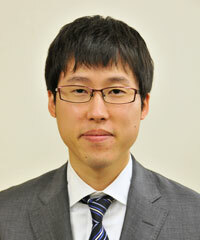 This year Yamashita made no mistake: he beat Cho U and topped the league with a score of 6-1. Ida also lost his final game, so Yamashita ended two points clear of the field. Yamashita lost the Honinbo title to Iyama Yuta in 2012, so this will give him a chance to take revenge. The title match will start on May 13. It will be the sixth best-of-seven between these two players; so far, Yamashita has won only one. So far this year, his record is an excellent 12 wins to four losses; since he has just lost a best-of-seven match, the Kisei, that means he hasn’t lost a game to anyone besides Iyama. Yamashita Keigo 9P (B) beat Cho U 9P by resig. Yo Seiki 7P (W) beat Ida Atsushi 8P by resig. 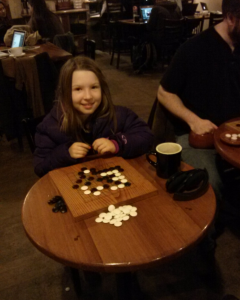 Kono Rin 9P (B) beat Ryu Shikun 9P by resig. Mimura 9P (W) beat Takao Shinji 9P by resig. Losing their places are: Yo (4-3), Mimura (3-4), Takao (2-5), and Ryu (1-6). Yo can count himself a little unlucky: he won his final game, but to keep his place he needed Kono to lose, as there’s no play-off for fourth place (Kono was rated higher). 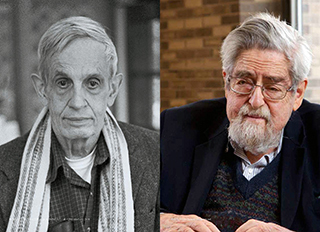 The Norwegian Academy of Sciences and Letters has decided to award the Abel Prize for 2015 to the American mathematicians John F. Nash Jr. (left) and Louis Nirenberg “for striking and seminal contributions to the theory of nonlinear partial differential equations and its applications to geometric analysis.” Outside mathematics, Nash is best known for a paper he wrote about game theory, the mathematics of decision-making, which ultimately won him the 1994 Nobel Prize for economics, and which features prominently in the 2001 film about him, A Beautiful Mind. That film included a scene of Nash — played by Russell Crowe (left, in photo at right) — playing go at Princeton that sparked interest in the game after the film’s release. A Call for Papers has just been issued for the 3rd Hangzhou International Go Culture Conference. The conference, sponsored by the Hangzhou Branch of the China Qi-Yuan (Qi, or Go department) will be held in October 2015 in Hangzhou, China. 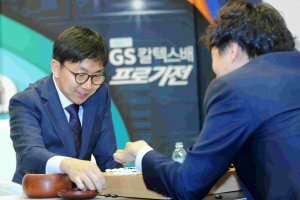 The conference will invite famous go players, specialists in go culture, principals of go organizations “and people of insight from all walks of life” who will discuss go culture to enrich go’s cultural resources and promote the development of go culture. Click here for details on the conference topics and submission guidelines (scroll down the page for the English version). Proposals for papers must be submitted by April 30th, and the full paper must be submitted by August 1st, 2015. Eric Osman sent in this snapshot from a recent meeting of the Western Massachusetts Go Club. The club meets Thursdays at 7:00 pm at Rao’s Coffeehouse in Amherst, MA. 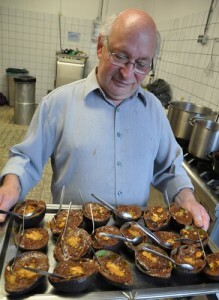 “All ages are welcome!” says Osman. - adapted from a report on Go Game Guru, which includes more details on Mok’s long road back to winning a title, as well as the Caltex game records.